Pearl Buck was an author. She spent a large part of the first half of her life in China. She wrote many books set in the Far East. She was the first woman to win the Nobel Prize in literature. Her most famous book is called The Good Earth. Pearl had a daughter with special needs who lived in New Jersey. Pearl wanted to live near her daughter. 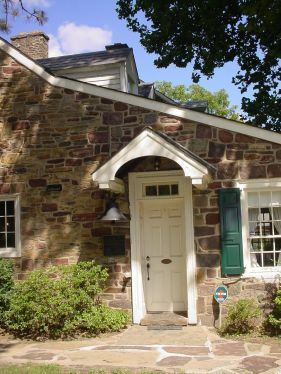 She bought a house in Bucks County, Pennsylvania. This house was called Green Hills Farm. Green Hills Farm is located just outside of Dublin, Pennsylvania. Pearl lived there with her second husband, Richard Walsh. This is the front of Green Hills Farm. The house is built of field stone. Inside the house, all of the furniture is the same furniture that Pearl and her family used. One upstairs room is filled with Pearl's books, her awards, and hoods from her honorary degrees. Located on the side of the house, this door was the family entrance to the home. Inside was a large mud room where everyone could take off their boots. Since the farm was a working farm in Pearl's time, there were plenty of muddy boots. Notice the large bell. Two views of the back of the house. Pearl and her husband adopted six children. They paved the courtyard so the children would have a dry place to play. Next to the house was a small one-room building.. Pearl and her husband expanded it to three rooms. This is where they worked. The walkway visible in the second picture leads from the house to Pearl's office. This barn stands next to the house. Once a working barn, it now houses meeting rooms and a gift shop. Pearl Buck is buried on the grounds of Green Hill Farm. Here are two views of her grave. Her chop is carved in the stone covering her grave. This is a stylized form of her Chinese name. In 1949 Pearl started an adoption service called Welcome House. This agency was designed to help with mixed-race adoptions. Welcome House is still in operation today. Many families have adopted children from all over the world through Welcome House. 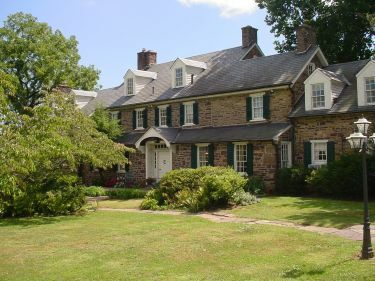 Today Green Hills Farm is a National Historic Landmark and the home of Welcome House. Mitchell, Barbara Between Two Worlds: a Story About Pearl Buck. Carolrhoda Books, c1988.